Holds PVC ID cards. Designed to be used in a secure facility using magnetic card readers. Can be worn either vertically or horizontally. Card holders can be worn on a belt or around the neck with a lanyard or clipped to clothing or backpack for quick and easy access. These holders provide dependable access to Smart Cards and other ID cards not capable of being slot punched. Holds PVC ID cards. Designed to be used in a secure facility using magnetic card readers. Can be worn either vertically or horizontally. Card holder can be worn on a belt or around the neck with a lanyard or clipped to clothing or backpack for quick and easy access. These holders provide dependable access to Smart Cards and other ID cards not capable of being slot punched. Card holder can be worn on a belt or around the neck with a lanyard or clipped to clothing or backpack for quick and easy access. Great item. Customers love the fact that they are able to wear their badge either around their neck or on their belt. 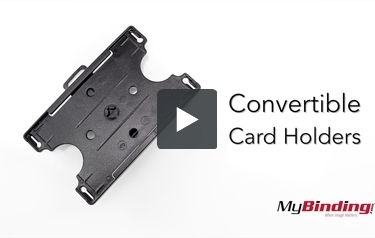 Very easy to put ID into this Convertible Card Holder. Item is remarkable! These are Convertible Card Holders! They conveniently hold your ID cards, allowing for easy access to them. On the back is a clip to which you can rotate depending on the orientation of your ID badge. Even hook it onto a lanyard or badge reel for even easier use. It’s versatilely made for whichever application you need it for, and is completely made of plastic. Clip it onto your pocket or your belt, or put it wherever you want, however you want. It’s your ID, so go show it off! Removing it is easy, but rest assured that it won’t fall accidentally either.